LOUISVILLE, Ky. — Looking sharp in maroon and silver football jerseys, and working together as a team, the Owen County High School Rebels won a state championship Friday. But the sport wasn’t football. That championship won’t be played for three more months. 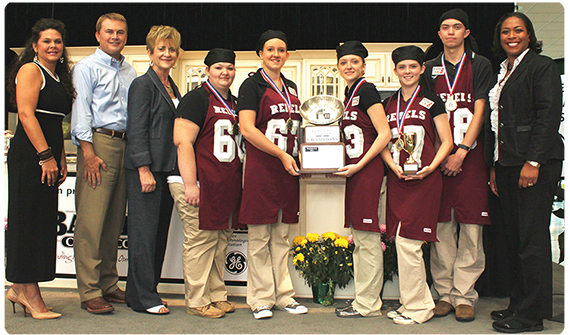 Owen County’s “Cuisine Rebels,” sporting aprons made out of old football jerseys, won the second annual Kentucky Farm to School Junior Chef State Tournament during the Kentucky State Fair in Louisville. Owen County made potato-crusted bacon cheeseburger quiche. The competing entrées are required to contain at least five Kentucky Proud ingredients, which are grown or made in Kentucky. “We went above and beyond,” Owen County family and consumer science teacher Kim Webster said proudly after coaching the Cuisine Rebels to the championship over Thomas Nelson High’s “Purple Cow Crew” from Bardstown. Hailey Chappell of Owen County was named Most Outstanding Chef for the state Junior Chef Tournament. Hailey is the daughter of Amy Chappell, Owen County Schools’ food service director. Sullivan University will offer $6,000 scholarships to members of the winning team – Hailey Chappell, Carley Bennett, Kadee Carter, Cannon Goodrich, and Morgan Woodyard. Each member of Thomas Nelson’s team will be offered $4,000 scholarships. The chefs on the two other semifinalist teams, Corbin High’s "Roasting Redhounds" and Owensboro Apollo High’s "Cooking Fairies," will have the opportunity to receive $2,000 scholarships. Sullivan offered more than $70,000 in scholarship money. Owen County’s team received $600 from John Wiley & Sons publishing company, along with free textbooks for team members attending Sullivan’s culinary program. Wiley representative Darchelle Leggett also presented the winning chefs with a book titled “Professional Cooking” and the runners-up from Thomas Nelson with a gift bag that included books and other items. Teams of 61 chefs from 14 Kentucky high school basketball regions faced off on the Gourmet Garden Stage in the lobby of South Wing A in the Kentucky Exposition Center during the State Fair. Junior Chef tournament organizer Tina Garland, coordinator of the Kentucky Department of Agriculture's Farm to School Program, said the number of schools and students who participated in the second statewide competition was up over the first year. Junior Chef, which is part of the Farm to School Program, encourages high school students to learn how to cook by using local ingredients to prepare healthy meals while at the same time teaching students about agriculture, marketing, organization, teamwork, and community involvement. The Farm to School Program connects local farmers to school districts to make fresh Kentucky Proud foods available to Kentucky children. Participating Kentucky school districts spent an estimated $468,000 on local foods during the 2012-13 school year. A total of 84 school districts are members of the Kentucky Proud program, which helps Kentucky farmers market their products to their local communities. Heat oven to 350°. Place diced potato in a medium saucepan. Cover with water and bring to a boil on medium high heat. Boil potatoes until soft. Drain all but 1/4 cup of liquid. Add margarine, salt and pepper. Mash the potatoes to a smooth consistency. Spoon roughly 2 Tbsp. of potatoes into bottom of greased jumbo muffin tin. Press to the bottom and slightly up the sides to form a crust. Bake potato crusts for 20 minutes or until they start to turn a golden brown. In a medium skillet, prepare the bacon until crisp. Drain on paper towels. Crumble bacon and set aside. In the same skillet, brown ground beef, onion, and peppers. Cook until no pink remains. Drain. In a medium bowl, combine remaining vegetables with ground beef mixture. Add bacon and 1/2 cup shredded cheddar cheese. Toss to mix well. In a separate small bowl, beat the eggs, salt, pepper, and milk until well combined. When crusts come out of the oven, fill each evenly with egg mixture, then evenly divide the meat mixture and top with remaining cheddar cheese. Bake 40 minutes or until golden brown. Top with a dollop of sour cream and serve. KY Department of Agriculture • Phone: (502) 573-0282 • Fax: (502) 573-0046 • 1-800-327-6568|Disclaimer| © Kentucky Agriculture Department. All rights reserved.